^ a b "Ballarat's Indigenous Heritage" (PDF). Sovereign Hill Education. Archived from the original (PDF) on 6 July 2011. Retrieved 19 August 2010. ^ a b "Heritage Impact Statement – Civic Hall". 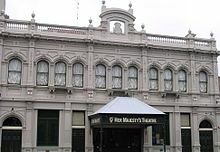 City of Ballarat. 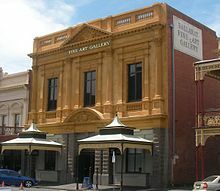 City of Ballarat. October 2011. Archived from the original on 8 March 2016. Retrieved 14 May 2012. ^ "Craig's Royal Hotel – History". craigsroyal.com.au. Archived from the original on 25 May 2012. Retrieved 30 June 2012. ^ "Multimedia Victoria – IBM expansion brings 300 jobs to Ballarat". Mmv.vic.gov.au. 4 December 2009. Archived from the original on 6 April 2011. Retrieved 18 August 2010. 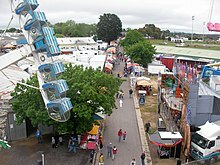 ^ "Ballarat Regional Tourism comes of age". Archived from the original on 19 March 2012. ^ "Moorabool Wind Energy Permit Application" (PDF). Department of Planning and Community Development. Archived from the original (PDF) on 15 March 2011. Retrieved 9 May 2012. ^ "Lal Lal Wind Farm – Quick Facts". WestWind Pty Ltd website. w-wind.com.au. Archived from the original on 21 March 2012. Retrieved 9 May 2012. ^ "Filmed Here". Film Ballarat Hepburn & Beyond. Archived from the original on 24 July 2007. Retrieved 18 August 2010. ^ a b "Streams, Lakes and Storages". Department of Primary Industries. 11 May 2010. Archived from the original on 20 May 2013. Retrieved 26 April 2012. ^ a b c "Water Storages". water.vic.gov.au. 12 October 2011. Archived from the original on 13 April 2011. Retrieved 26 April 2012. ^ Suzanne, Tindall (24 March 2009). "May date for Vodafone 3G bush launch". CNET. cnet.com.au. Archived from the original on 4 April 2009. Retrieved 1 May 2012. ^ "Myki to start on VLine Commuter Services". VLine Pty Ltd. Archived from the original on 27 August 2013. Retrieved 7 August 2013.